Ninja Timmy, by Henrik Tamm. Illustrated by the author. NYC, Delacorte Press, November 2015, hardcover $14.99 (211 [+ 2] pages), Kindle $9.99. This children’s book was originally published in 2013 in Sweden as Ninja Timmy Och De Stulna Skratten, although it was written in English. Henrik Tamm is described in an About the Author as “a conceptual designer in Hollywood involved in various animated and live-action projects” (p. ), including the Shrek and Chronicles of Narnia movie series. This children’s book for 8- to 12-year-olds (grades 3 to 7) is technically too young for furry adult readers. But, like many CGI animated features, it will be of interest due to the setting (a Medievalish European metropolis inhabited by anthropomorphic animals and humans together), the full-color illustrations on almost every double-page spread, and the plot of natural and magical evil and the young animals who fight it. The visual richness is evident from the moment of opening the book. The front double-page endpapers show a panorama of the city of Elyzandrium busy at midday, with high towers and dirigibles and ascension balloons overhead. The rear endpapers show the same scene but at night, dark blue and with empty streets, but with the city’s windows all alight. They are orphans who escaped from the city’s orphanage and have become amateur inventors, peddling their tinkerings for food, lodgings, and the junk that they build their clever devices from. But they are tired of being robbed by older gangs like the brutal Gribble wild boar cousins, and accused of being “probably criminals” themselves by the equally-brutal city guards if they complain. 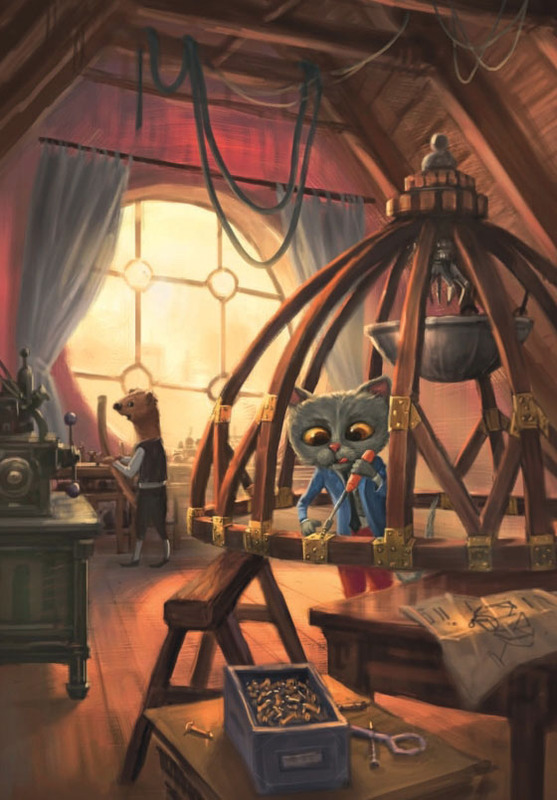 Timmy is about to be arrested after one such incident when he is rescued by Alfred, an elderly human inventor whose clockwork devices are at least partly magical. Alfred has become quietly dismayed by Elyzandrium’s gradual decent over the decades into legal and illegal lawlessness, and he puts his expertise to the help of Timmy and his friends’ determination to fight back against the gangs, in secrecy as ninjas. They are just in time, because something or somebody (revealed to the reader as the Rabbit, a tall, bright blue rabbit with fiery eyes; a wizard) has been robbing the city’s animal and human children of their laughter. The Rabbit is also the secret sponsor of the Gribbles. Timmy has a girlfriend! He hopes. Actually, Timmy is still young enough that he doesn’t know what to do with a girlfriend. Simon, who is slightly more experienced, gives him older-brotherly advice. Meanwhile, the four foil the Gribbles’ nighttime attempt to kidnap an infant puppy. This brings them plus Flores to connect the Gribbles to the loss of Elyzandrium’s children’s laughter. Unfortunately, it also brings them to the Rabbit’s attention. He decides that he can use Flores in his plans. Timmy? Kill him. But the Gribble cousins seem too amateurish and clumsy. The blue Rabbit sends the more efficient Gack the iguana and his Iguana motorcyclist gang (steam-powered bikers) to kidnap Flores. The climax is the animal heroes’ breaking into the Rabbit’s lair to rescue Flores and all of the children’s stolen laughter. It would be a spoiler to reveal what the Rabbit wants the laughter for, but it makes the Rabbit a more pathetic than evil creature. Let’s just say that the book ends with Timmy and his friends victorious and ready for new adventures – and one is presented to them. 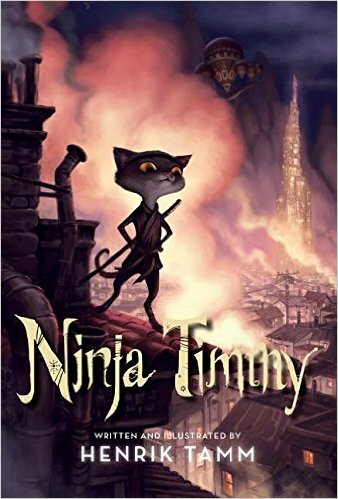 Ninja Timmy is a light trifle for adult readers, but it would make a great outline for a CGI animated movie for the family. 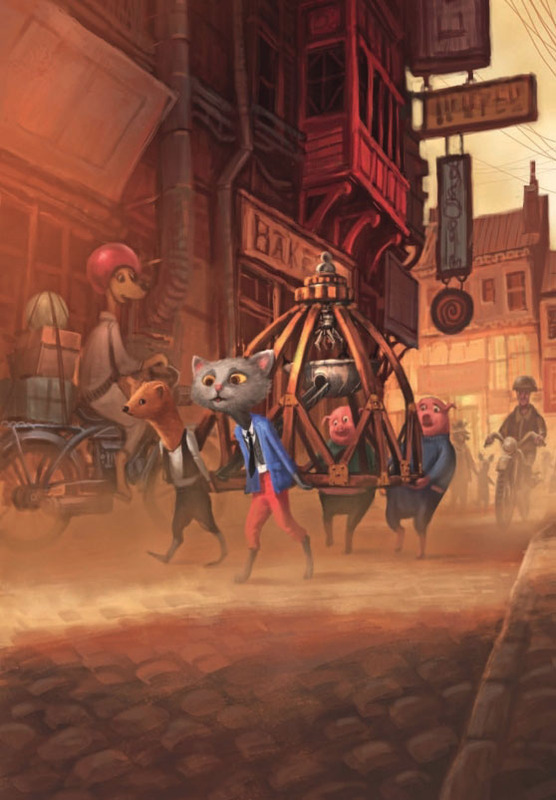 Furry readers will appreciate the steampunk city of anthropomorphic animals and humans living peacefully together. Most furry fans are still too young to become parents, but when they do have children, this will become a good book to remember.